"Only about 25% of U.S. cell-phone customers have a data plan. So the mass of users generally can't access multimedia content on their phone without incurring unwanted fees. Hook Mobile is a platform that acts as a go-between for social media and content companies and the mobile carriers to open up MMS as a network to expand content consumption on phones. "Social media is where content is uploaded and shared," says Craig Dalton, Hook Mobile's VP of business development. "We're bringing that bite-sized content to MMS. Why limit the delivery of a sentiment to Facebook?" Hook Mobile thinks it has a leg up because it's done all the hard work behind the scenes, and customers are already used to the idea of MMS through their avid use of SMS. "Nothing elicits a more definite response than when your phone beeps with a message," Dalton says. 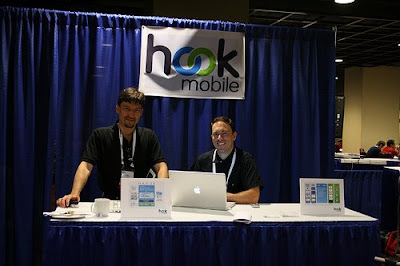 Hook Mobile handles intercarrier connectivity and billing, and it optimizes the photos, images, or audio for each user's phone bandwidth and screen dimensions. Its challenge is finding the right customers to convince to use its service. For example, Paramount Studios is a client, delivering movie clips from its Facebook app, Voozoo Mobile, to any mobile phone." I was given the opportunity to present at the Under the Radar conference in Mountain View, CA this week. It was a great opportunity to talk about the Hook Mobile platform to the start up community. 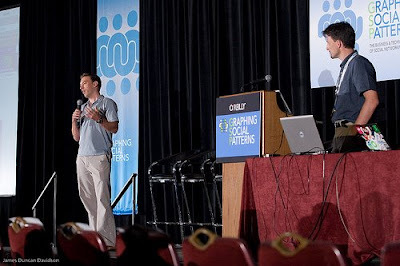 UTR did a great job of getting wireless operators, VCs and content owners into the room which created a unique opportunity to get feedback. The presentation went well (although I wish I had 'paced' a little bit less). Jeff from CBS had some tough questions for me at the end, but after the session he told me they do want to find a way to work with us. I enjoyed UTR very much as it brought together lots of different companies who look at mobile from different angles. My favs had to be Smule for shear entertainment value and Billing Revolution for providing a quick and efficient mobile billing option. In classic Mobile 2.0 Meet Up fashion, I'll be delivering a 4 minute, 4 slide, 4 questions presentation on Thursday night. The subject is SMS 2.0 which provides a good forum for discussion the current state of MMS (available and ready to go) and the reason why, historically, it hasn't been deployed as an offering by 3rd party content owners. This kicks off a busy two weeks of presenting. As mentioned previously, I'll be presenting Hook Mobile at the Under the Radar conference on November 12th. Both events should be really fun. I'm looking forward to them! Since day 1 the iPhone was announced, I've been miffed that they excluded MMS from the functionality of the device. It never made any sense to me from a consumer perspective, nor from AT&T's perspective. At Hook Mobile, we've developed a cross-carrier MMS delivery platform that partners can use for content optimization and delivery (in addition to many other things). As the one entity that sits between all the carriers for MMS, we found ourselves uniquely suited to do something about the iPhone MMS issue. While today, we can't 100% solve the 'receive an MMS on the iPhone' problem, we can solve the 'send MMS' problem. We are in the process of submitting an application called MMS to the Apple App store. The application allows iPhone users to select images and send via MMS to friends mobile phones. The message is uploaded to us via http, then optimized for the target device and delivered via the carriers MMS infrastructure to your friends messaging inbox. No data download required by your friend, they just need a messaging plan. In future versions, we'll be adding functionality and hopefully address the receiving issue. Until then, keep a look out for it in the app store. I'll post again when we launch and share Ad Hoc with a lucky few! Hook Mobile was selected to present at the Under the Radar | Mobility conference on November 12, 2008 in San Jose. We will be discussing the Hook Mobile platform and the MMS opportunity. 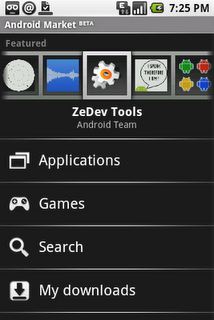 It was widely reported yesterday that the revenue split for Android developers will be 70/30. Unlike the Apple App Store, the 30% in this case will be going to the operator (currently T-Mobile for the G1). Since the operator is going to be responsible for the billing and delivery, this makes sense. Not to mention that this is the traditional model pursued by operators and app developers. I was happy to see that the split was 70/30. As anyone in the mobile content business can tell you, splits have been steadily getting less favorable to the developer over the last few years. I thank Apple for pushing 70/30 as the norm. Application developers shoulder virtually all the risk and as these marketplaces become more competitive so does the need to create more complex (read: more expensive to develop) applications. I hope we continue to see more Android phones appear on other networks with the same model. Check out the dedicated site T-Mobile just launched for the upcoming G1 (Google Android phone) from HTC. I watched the live press event today and the device looks great. A lot of cool features that will give the iPhone a run for its money. Some of the mapping functionality looked useful, if not novel. At $179, it should be an attractive device to consumers. T-Mobile claims it will be launching its largest advertising campaign ever in October to support the launch. It is going to be interesting to see how their reach will compare to Apple's. One thing is for sure, the pace of innovation in mobile is going to continue thanks to this new entrant! Nic Elder at Apple iPhone Apps Review did a nice review on the available iPhone 'MMS' apps. At first glance the Flutter app seemed really interesting, but upon deeper review it is clear this app has nothing to do with MMS. Nic accurately points out the many shortcomings of this app from a consumer perspective. He gives props to SwirlyMMS, but the reality is that even for consumers with jailbroken phones Swirly is tough to set up. Just try to find your carriers MMSC settings. Maybe someone is working on a 'real' MMS app for the iPhone that can be sold in the App Store...stay tuned. "Developers will be able to make their content available on an open service hosted by Google that features a feedback and rating system similar to YouTube. We chose the term "market" rather than "store" because we feel that developers should have an open and unobstructed environment to make their content available. Similar to YouTube, content can debut in the marketplace after only three simple steps: register as a merchant, upload and describe your content and publish it. We also intend to provide developers with a useful dashboard and analytics to help drive their business and ultimately improve their offerings." This certainly sounds 'open'. Here comes the wild West of mobile content sales. I've been reading a lot recently about how revolutionary the Apple App store is and most recently how T-Mobile USA is going to release a similar App store to replace their dysfunctional on-deck offering. Is the App store really all that great? Lets dissect the App store experience into two segments: 1) iTunes online 2) the on device experience. I won't argue that the iTunes online store isn't great. It obviously surpasses any online commerce efforts put forth by the wireless operators. It is the on device experience that I question. On device, the iPhone App store is doomed to become as cluttered as the wireless operator decks and ultimately require the same management as it grows. Even today, the only reason the store is more navigable than a traditional deck is due to the superiority of the device (namely more screen real estate and great screen). So why is the App store so great???? The device is great, but the App store experience isn't any better than the carrier deck. The noise T-Mobile recently made in the press is ridiculous and I'm eager to see the chaos created by this move. I suspect the decks on feature phones will get even more confusing. I've long predicted that on the road to 'open' the wireless content business is going to suffer. T-Mobile looks to be accelerating the begining of the process. It is probably good for the long run, but take your money out of any company who relies on 'deck sales' for their revenues as it will be a highly volatile time. And everyone...keep in mind that trading our 'master' from the wireless operator to Apple doesn't solve much. iPhone Apps are about as open as the carrier deck are at this point (unless you have a jailbroken phone)! It is quite difficult to find the words to describe the Transrockies experience so many come to mind. Beauty, Joy, Misery, Agony, Suffering, Sore, Sick, Wet, Dirty, Elated, Dejected and on and on. To put this race in terms that might resonate with some of you. 7 Stages, 58,000 feet climbing, 342 miles of technical off road riding. Imagine the camping situation of Wildflower, but you have to break camp before you race the long course at 8 am every day - now do that 7 days in a row with 20x the elevation gain. 300 teams of 2 riders from dozens of different countries. Other than the notions that this was going to be 'hard', I didn't have many expectations for the race. I wanted to ride to the limits of my ability and face challenging terrain. Little did I know that those boundaries would be stretched farther than I thought possible. Mark and I lined up with much enthusiasm for Stage 1 after the long trip to Panorama and the many bike building, bag sorting chores the night before. The sun was shinning and riders from dozens of nations waited anxiously to get going. The gun went off for the parade lap and we set off to gradually, patiently pick our way through the teams ahead of us. Knowing a massive climb leading to singletrack was ahead, we set the goal of moving up as much as possible without breaking my legs in the process. We did well to clear the 'riff raff' during the hour + of climbing that ensued. I was struggling on the climb as was to be expected, but felt OK once we started traversing the singletrack ridge. Our fine weather quickly deteriorated as we crossed steep shale fields. Within minutes we were riding in hail and snow! At the sunny start line, we had elected to travel a bit light on gear (just jackets). As if that wasn't bad enough, Mark sliced a 2.5 hole in his tire requiring a careful, fingers crossed repair job in the snow! We took about 20 minutes to get back sorted out before we continued traversing and descending the mountain. We road well throughout the stage, but realized if this was a 'easy stage' we were in for one hell of a week. We arrived at K2 Ranch to get our first look at tent city. Each evening tents would be erected and available on a first come first serve basis, along with showers and bike washing. We settled in to what would become our daily choirs, tent arrangement, unpacking, bike wash, bike repair, shower followed by evening dinner and next days stage review. Waking up crusty and damp in a tent at 6 am knowing that we were soon to be climbing nearly 10k feet was quite difficult. Still in the 'excited to be here' phase, we packed our bags and headed to the start line. Due to our mechanical on stage 1, we were in start group 2 which put us behind 1/3 of the pack at the gun. With a longish jeep road to road section ahead of us, Mark and I drilled it from the gun working our way through the pack like a road race. We managed to bridge to the lead group just in time to start climbing. I was a bit cooked from the chase so I had to insist on a casual pace even though Mark's legs were telling him otherwise. We proceed to climb and/or traverse forever. After aid station 1 we started to see people pushing there bikes up the trail and eventually we were relegated to the same strategy. I started to suffer as the trail got steeper and steeper as unlike Mark as an adventure racer, I haven't spent much time pushing my bike. Just when I thought things couldn't get worse we reached a plateau and saw an ant line of riders with bikes on their shoulders hiking up the steepest rock field you can imagine. We resigned ourselves to getting it done and took our place in line. After about 30 minutes, we started to hear people call down the hill asking if anyone could see a trail marker. Apparently the entire top 1/3 of the race is off course! We discovered with the help of other racers that we had climbed passed the turn off and were torturing ourselves for no good reason (the pros had probably gone an entire hour up the hike-a-bike hill!). We bushwacked through the woods to rediscover the trail amongst the chaos of 100s of confused racers. We then hit some gnarly steep singletrack which I enjoyed which lead to an even gnarlier section of sloppy, wet, creek crossing singletrack. We emerged from the woods to learn the extent of the race chaos....we discovered that we were in the top 30 teams. We decided to keep hitting it in the hopes that we could make up some time from the day before. The pro teams eventually caught us on the run into Nipika. It was actually quite surreal getting passed by the pro who looked effortless as they danced by us. We felt we road a great stage and would easily make up the deficit we created on stage 1. Unfortunately we would later learn that this stage would not count on the General Classification b/c of all the lost riders. While I appreciated the situation, I was a little disappointed as we road very efficiently and had in this tough stage (not too mention that we wasted time lost as well!). Nipika was to be our home for two nights. It is a great eco-lodge built entirely of products found on the property. Stage 3 was a first for TR: a time trial. Rider were set off at 30 second increments on a shorter course (I should note that this short course still contained more climbing than almost all of our normal training rides). Mark and I both felt good on this stage so we really pushed our limits. We managed to catch all the riders ahead of us which gave us a clear look at the amazing singletrack course. We road the ridgeline of a gorgeous river most of the day descending and climbing through the rocks and trees. I think we were both enjoying ourselves despite the quick pace. We've learned that Mark and I are one of the better singletracking teams in our division so this course suited us well. One of the most memorable moments of the day was coming upon a motocross rider on a steep singletrack descent. We were totally committed to a shoot, when we discovered the Moto rider, we yelled, he crashed and we rifled by him. We finished the day in 9th in our division which was very satisfying. Our morning start afforded us a leisurely afternoon in Nipika and some well earned 'ease' in our daily schedule. Later in the day we learned that our friend Greg had broken his frame. Ever the solution oriented thinker, Greg bought a new Rocky Mountain bicycle to continue the race the next day (more on that later). Stage 4 was the longest stage in KM so we knew we were in for a rough one after our efforts in the TT. We had another very fast start which left Mark feeling a little winded, while I on the other hand was feeling quite spunky. Today's stage was a bit less steep which suited me well and I quite enjoyed the long climbs and river crossings. The team aspect of TransRockies adds and interesting dynamic to each day as it is as important for your partner to feel good as it is for you. While I was struggling to stay with Mark on the first days he was now struggling to stay with me. As good teammates and friends, we just did our best to keep moving and cover this long stage. We cleared the toughest climbs and started a long single/double track descent. At one of the last checkpoints we heard of a bad crash a couple of KM behind us. A little investigation (and the arrival of his teammate, Carrie) led us to learn it was our friend Greg and most likely a broken collarbone. We were totally bummed, but knew he was being as well taken care of as possible (he ended up with a helicopter ride home). We push on through the stage and hit a long road section to the finish. I was pulling hard, but honestly as cracked as Mark was with the long hours of riding. We pulled into a beautiful field and headed for tent city. We discovered a creek behind some trees and decided to soak our weary bodies, before tackling the chores of the day. Whiteswan lake brought a welcome addition to tent city....a local MTB club cooking burgers. Now we could have dinner #1 at 3 pm in prep for dinner #2 at 6 pm! We continued to meet riders from all of the world and developed a crew of bay area riders that we spent most of our time with. We knew from the course overview the night before that Stage 5 would be rough. Almost the same amount of climbing as the day before in 12 less miles. We've learned at this point that what that really means is 'get ready for a big hike-a-bike section. Mark was still feeling a bit dodgy but as always he remained up for the challenge. We hit the course and again for unknown reasons, my legs we magic (despite having picked up a sore throat). I found myself riding many of the sections people were walking which felt great. I think Mark recognized that I was probably going to pay a heavy price for this exuberance, but he let me go anyway. Sure enough we hit the final aid station and got reports of a heavy duty hike-a-bike section in front of us. We shouldered our bikes and got started with the frustrating task at hand. After a LONG time, we finally crested the pass only to be greeted by the 'rock garden'. The rock garden is essentially a descent that is 100% on 6-12 inch rock. There is no possible way to ride other than picking your way on top of 1000s of rocks. While not my idea of a good time, I relished the technical challenge of the section and pointed my Niner downhill. The combination of gravity, big wheel and a little prayer helped me navigate the 5k of rocks. Mark, with a look of shear terror, decided this wasn't his cup of tea and proceed to dismount and run/walk the section. If poor Mark hadn't been tortured enough already after the rock garden we had 10k of technical dirt/rock descending to do. I'm glad I was ahead of Mark as I'm sure he was cursing my name for a good 20 minutes as he picked his way through. We finally hit a fire road into town and knocked out the remaining 10k. It was so hot today that we were both totally fried. Arriving in our first official town, the finish line spread was filled with treats that we hadn't seen all week (gold fish, chips, lemonade, muffins). It was a little bit of a shock to the system to see buildings etc, but the comfort of tent city was just around the corner. As a big bonus we learned we were next to the town pool and we were given free access for a bit of a swim (after finding the requisite mtn. stream to soak in first). We ate dinner in a hockey rink and we greeted by the town mayor. Mark discovered while inspecting my bike that my bottom bracket had frozen and looked at me questioningly as to how I made it all day with cranks that barely turned (I told you I had good legs). I dropped the bike off at the bike shop that traveled with the race to have a new BB install over night. Suffice it to say that another long stage was not what the doctor ordered for our weary crew. My sore throat had gotten so bad that I could barely talk to Mark. For some reason my legs were still good, but the voice was gone. I felt bad because I couldn't communicate well with Mark to offer any words of encouragement along the way. It was another hot and long day on the race course. We did our best to keep moving efficiently, but I think we both new this was going to be a rough one. We were greeted with some spectacular views and some amazing river crossing which took the sting off a little bit. We crested one of the longer climbs and started a very fast ridgeline descent. The film helicopter was off to our right with a camera man leaning out of the cockpit. I felt like I was in an MTB video as the copter paralleled our fast descent down the ridge. We hit the final aid station and knew we had another 2000ft of climbing and purportedly hike-a-bike ahead of us. I was feeling pretty good in the legs, but I knew Mark was hating this stage. We continued on as Mark comically stated he needed to soak his feet in the river (I had to admit I had a little of the Canadian hot foot myself!). We found some water for Mark to soak it, but it didn't change the fact that we had a bunch of annoying hike-a-bike to get on with. We slowly made our way through and crossed the finishline with our weakest performance of the week. Despite all the good singletrack in the race, most of our conversations with fellow races was about the unnecessary hike-a-bike sections that seemed to always be present. Its a shame b/c I think the organizers wanted it to be the toughest bike race in the world which took away from the racing aspect and made some stages more like survival stages. Fortunately Blairmore had two things going for it that day. A great soaking river and a pizzeria. Mark made a b-line for the pizzeria after the race and ordered us a cheese pizza. We did a 15 minute soak in the river, then sat on main street eating a pizza! Somehow that Pizza started to change things for the better for Mark. Knowing we were on our last stage (and having the boost of yesterday's pizza party), I think both Mark and I was in good spirits despite the growing all over body fatigue (and my cold which had now progressed to a cough). We hit the start line determined to race again. The race started with a climb up a ski resort hill which we fought valiantly up to maintain our position going into the singletrack. We hit a bunch of traffic, but patiently worked our way through the slower singletrackers ahead of us until we had clear trail. We worked well together making sure we were pushing each other as hard as we could in each section. The day had some mentally draining climbs in the middle. At one point I think we were both head down and silent begging for the second aid station to appear. We knew once we hit that section we were blessed with a downhill ride (for the most part) to the finish. We went ballistic down the fire road to find the singletrack and kept the gas on through the first of many sections of 'Fernie' singletrack. For me, hitting the singletrack is like putting gas in the tank so I was ready to rip. We emerged onto another fire road with a group of riders and took a right turn up a hill. Now it is worth noting that when you study the course profile you tend to forget about certain things --- like this damn hill. We started on this hot climb thinking we were almost done not knowing that TR had one more tough as hell climb for us. Probably inconsequential compared to early climbs this one just seemed particularly nasty. We finally made it to the top where local told us that we only had 6k to go and it was all singletrack. Boy they weren't kidding, we hit one of the best, technical singletrack descents I've ridden. It took everything I had to navigate the turns, trees, roots and drop offs they were throwing at me. I finally washed out and crashed lightly which gave Mark a good laugh since I'd stayed upright all week previously. We made it through the track and rolled into downtown Fernie to a heros welcome. We had just finished the TransRockies! We had a good stage and placed 16 in our category and moved up 6 spots on the GC to finish 24th overall. We enjoyed snacks, drinks and a basket of fries Mark bought before landing a ride with all our gear to our hotel. Again, we found a great river for a soak then enjoyed a late afternoon of Olympics viewing on our first beds in a week! It was an incredible experience with many highs and lows. I enjoyed the race format and organization, but felt they should have made better choices on the route to avoid some of the hike-a-bike. I'd recommend the race format, but would advice looking into TransAlsp or BC bike race as you stay in hotel and you actually ride the course! Niels and I manning the booth at GSP East. Lots of good sessions. Last night I attended the SF Mobile 2.0 Meet Up which featured presentations from Symbian, Zannel and Juicecaster. It was really interesting to hear Zannel and Juicecaster side by side as the differences in their business models highlighted some ongoing discussions I've been having with Noel, CEO at Mosio. Specifically we've been discussing the benefits and challenges to on-deck versus off-deck distribution. Without going into too much detail on either company, both offer lifecasting services from the mobile phone. Zannel's system works via WAP across all carriers, while Juicecaster has JAVA or BREW applications across many by not all carriers. Zannel is monetizing their offering via advertising and sponsorships, while Juicecaster is charging a monthly service. Zannel claims to have well over a million users, where Juicecaster sheepishly claimed to be over 100,000. Here comes the big difference. Juicecaster, sold for $2.99/month in partnership with the carriers would be generating around $180,000 per month post carrier (my estimate allowing the carriers 40% of the revenue). I have no idea what Zannel is charging for their advertising and sponsorship solutions, but with even 10x the users, I suspect the revenue is less. Juicecaster's revenue is subscription based which means that they are not only getting that first month, but likely 6+ months per user regardless of actual usage. It is worth noting that Juicecaster has been in existence for at least 3-4 years and has worked very hard to get the carrier deals in place. Zannel's strategy is totally appropriate given the time it arrived in the market. I hope that all the emerging WAP strategies will work well, but for today if given the chance at carrier based revenues, I'd take it any day of the week. The best strategies will do a little of both (why leave revenue on the table? As we continue to investigate how users interact with Social Networks and Social Network Applications from mobile devices, it is important to consider whether we are talking about 'accessing' networks or 'consuming' content. The former has been tackled by a number of companies including the SNS containers themselves. Facebook and MySpace each have well trafficked WAP sites that allow users to pull content. Other access strategies include J2ME and BREW applications from the likes of Intercasting Corp and Juicecaster. In addition to access, these applications do also promote a mobile originate (MO) broadcasting feature. Both the WAP and Application solutions absolutely have a home for the power user. I do, however, see a few challenges for these solutions. Namely, users need to actively navigate to these applications / WAP sites on their device. This is appropriate in moments of inspiration such as when you have a great photo or video to share or if you have some time to kill and happen to be poking around your device, but like all great mobile offerings, the risk is that they stay buried on the device as users are focused on other higher level device functions such as text messaging or voice calls (remember voice?). I can confidently say this having studied usage patterns of top selling mobile games during my time at I-play. So lets move on to the concept of alerting. Now let me clarify, if a user is 'in' an application or actively 'on' a WAP site, alerting can occur, however this doesn't necessarily notify the user who is outside the site or application. Most major networks have implemented an SMS notification of site 'events', but like the SMS alerts we all signed up for in the early 2000's, notifications eventually get turned off when they become overwhelming. So where is the opportunity with alerting. I believe the opportunity lies in the SNS sites and applications having the ability to bring components of the online experience to mobile devices via multimedia messaging (MMS). The huge difference between SMS and MMS is that with MMS we can deliver the content itself (not simple a notification). Imagine sending a video poke to your girlfriend on a Friday evening when you know she has already gone offline. By sending the video to her phone, you know she'll receive the actual multimedia message. You know this because we all leave the house with 3 things these days; keys, wallet and mobile phone. It is no secret I am a big proponent of MMS, however my promotion of MMS doesn't take away from my belief that the entire spectrum of mobile technologies (SMS --> MMS --> WAP --> Apps) have a home in social media. In my ideal world, my favorite social media apps will allow me to share content using MMS while still providing WAP or Apps when I want to pull content. 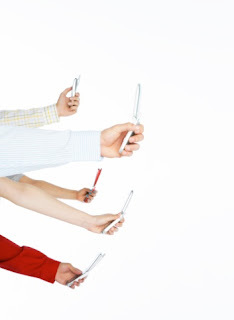 MMS, and messaging in general, should be used as a bridge to deeper mobile experiences. By delivering the entire experience within an MMS we can create a positive 'awakening' event for the device and user (phone beeps and content is one click away). Once the device is awakened, if the user has more time to consume, they can be directed to one of the available access options. The Hook MAX Platform protect mobile subscribers from unwanted content via 7 level of rules enforcement. I'm going to be speaking on a panel at the upcoming GSP East event outside Washington, DC in June. I'm excited about the discussion we will be having about mobile and social media. 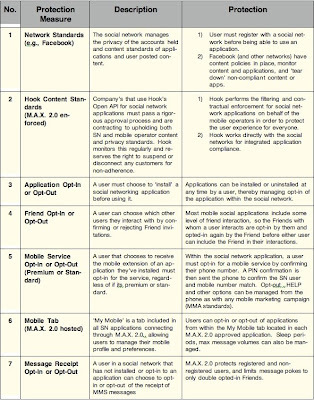 I've been thinking more and more about a framework for understanding the options one has when pursuing mobile. I believe there is a spectrum of opportunities in mobile that vary in cost and complexity. Each has its benefits and challenges. In the next week I hope to give an overview of the following technologies on my blog. "Hook Mobile understands the importance of subscriber protection in order to protect users of social networks from receiving content or services unwillingly, incurring charges without proper disclosure, and gaining access to content or services that is inappropriate for the audience. At the same time, Hook Mobile understands the potential liability risk mobile operators can take on when the proper subscriber protections are not in place, especially in the context of the new social networking environments in which the flow of communications and content is not always of the old ‘one-to-one’ variety, but in some cases among and between friends and shared interests. So to achieve the optimal mobile subscriber protection in a social networking environment, Hook Mobile has extended social networking applications with opt-in only MMS push platform, M.A.X. 2.0. This protects users by utilizing the double-opt-in process of normal mobile marketing, along with two additional opt-in processes for i) application acceptance, and ii) Friend confirmation. So at the very least, mobile subscribers receiving services through M.A.X. 2.0 are protected by an integrated ‘triple-opt-in’ of the content, services, and friends that are part of their “mobile social” experience." Hook Mobile got some great coverage in Mashable today. My good friends Bill, Jordan and Dave just launched a site called Ztail (www.ztail.com) that aims to help you find out what things are worth. Personally, I think it is a great idea. As a gear head, I have a whole garage filled with stuff I don't use and probably should sell. But how do you know how to value a bike that was build of misc. parts? 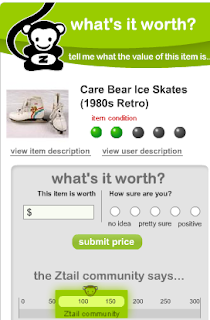 By asking the community what something is worth, you can get a sense for how much to expect should you throw it up on eBay. Check it out when you get a chance. It gets addictive when you are 'worthing' products! 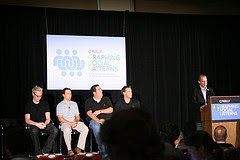 O'Rielly puts on a great social media conference called Graphing Social Patterns. I attended the last conference in San Diego after I joined Hook. It was really insightful from a content perspective and very fruitful from a networking perspective. The next GSP event is being held on June 9th-11th just outside of Washington, DC in Arlington, VA. Since the Hook Mobile HQ is just down the road in Vienna, VA, it made sense for us to jump on board as a Gold Sponsor. We are very excited to be part of the program now that the Hook MAX Platform has been launched. We look forward to meeting more of the community. Make sure to reach out to me if you will be in the area. Yesterday I had the opportunity to speak with Craig Dalton of Hook Mobile. Hook Mobile has developed a platform which helps integrate MMS technology with social applications. They’ve already launched one application on Facebook called PicToPhone. The application enables users to view their friends photos on a daily basis through MMS technology. The application has been used as a demo so that developers can see how to integrate MMS technology into their own applications. Throughout the podcast, Craig and I discussed the various challenges facing the convergence of social and mobile technology. We also discussed the various ways that businesses are trying to monetize applications in the space. Just yesterday, Nielsen released statistics that in the first quarter of 2008, 1.6 percent of all mobile users in the United States had accessed a social network via their mobile device. While it is only 1.6 percent, this space is growing rapidly and could become one of the most dominant areas for social technology to expand into. Listen to my interview with Craig Dalton below to hear more about how the social web can leverage mobile technologies. MMS is an evolved form of SMS. It is a technology that enables the creation and sharing of messages with rich content. MMS-compatible devices can send and receive multimedia messages, such as graphics, video and audio clips, etc. MMS messages can convey content up to 250 KB today on a cross carrier basis with those thresholds improving quickly. MMS has several significant advantages over WAP-Push/SMS delivery. - MMS is the most efficient way to deliver multimedia content as the content is encapsulated in the message itself. Users simply need to know how to hit a single soft key button to open a message. Once the message is opened, the multimedia content can be viewed / played. - MMS’ can be single images, multi-image slideshow or full motion video today. - MMS is a better user experience. Users can watch video, scroll through slideshows and read inputted text within the standard MMS client on their handset. - Pricing. MMS is typically subscribed to within a message bucket or can be used on a per use basis. Unlike WAP-Push which requires both a messaging and data plan, MMS only requires a capable device as users can make single use purchase decisions. Its been a long time since I've actually written anything on the blog and even then you could barely call it writing...more posting. I been getting into microblogging via Twitter which has renewed my interest in the whole concept. I'm going to start sharing some more verbose thoughts on this blog to cover some of my interests in mobile and social media along side a bit about my racing activities.